Home / News / Purchasing Articles / Don't Think That You Can Fit Training Into Your Busy Schedule? Don't Think That You Can Fit Training Into Your Busy Schedule? Use This Career Development Planner To Prove That You Can! Each Next Level Purchasing full-length online purchasing class requires about 7-8 hours to complete. However, unlike traditional training, you can spread out these hours of training over 60 days and can take the classes anywhere, anytime! Now, it's not so hard to fit training into your busy schedule. 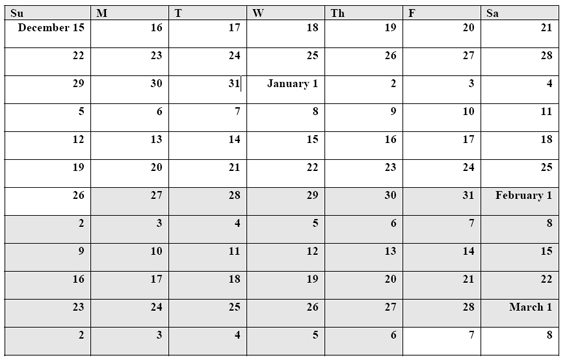 Here is a calendar for the next few months. Simply write a one-hour range (e.g., 12:00 - 1:00) on 8 different days and - viola! - you have planned to develop your skills without disrupting your busy schedule.